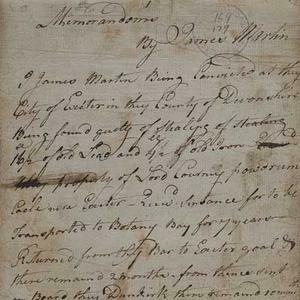 The most well-known escape of prisoners transported from England to Australia in the 18th Century has been brought to life, thanks to handwritten accounts by the convicts unearthed in the collections of the philosopher Jeremy Bentham at UCL and now published online for the first time. The Memorandoms of the convict James Martin are the only first-hand account of the famous escape, which has been the subject of a number of books and a television drama. The document is written in three different hands, potentially of three of the convicts involved, and recounts their fascinating - and, ultimately, tragic - tale in full. On the night of 28 March 1791, James Martin and eight fellow prisoners including William Bryant and his wife Mary Bryant - accompanied by their two young children - stole the governor's six-oared boat and escaped from Botany Bay, New South Wales, Australia. The group travelled along the eastern and northern coasts of the Australian continent, where they encountered Aboriginal peoples, and survived several ferocious storms. It was an incredible feat of endurance and seamanship, as they all survived the two-month journey of over five thousand kilometres in an open boat - partly in totally uncharted territories. I think this document should have a wider audience than it otherwise has had because it is the only first-hand account written by First Fleet convicts and it's such a well known story - probably the most famous escape story from colonial Australia. When they eventually landed at Kupang, West Timor, they posed as survivors of a shipwreck and enjoyed the hospitality of their Dutch hosts. However, they were eventually identified as absconders and sent back to England as escaped prisoners. Tragically, four of the prisoners and the two children died on the return journey. The survivors were eventually released after serving the remainder of their sentences in Newgate Prison. "I think this document should have a wider audience than it otherwise has had because it is the only first-hand account written by First Fleet convicts and it's such a well known story - probably the most famous escape story from colonial Australia. It is often told with a focus upon the figure of Mary Bryant, with the other convicts reduced to little more than ciphers. So, I hope that by publishing this narrative online and fleshing out the perspective of the other convicts, it will help to create a more rounded story." Jeremy Bentham was interested in New South Wales and convict transportation largely owing to his failed 'Panopticon' prison scheme, which was designed to allow a single watchman to observe (-opticon) all (pan-) inmates of an institution without them being able to tell whether they are being watched or not. He believed this simple architectural idea would mean that the prisoners would modify their behaviour and learn to work and behave well. Bentham spent many years trying to get the Panopticon built and one of the reasons given to him by the Home Secretary for the eventual abandonment of the scheme was the improved state of the prison colony in New South Wales. Dr Causer said: "Bentham was outraged by this and he wrote two very antagonistic open letters to the Home Secretary decrying the state of New South Wales. He gathered a lot of ammunition about the colony to try and portray it as a sink of immorality, a place where convicts would never be reformed and would be a constant drain on the country, and he appears to have acquired this narrative at some point along the line. It's not clear when or how he acquired it, but we're very fortunate to have such an important document in the history of convict transportation and colonial Australia here in the UCL collections."